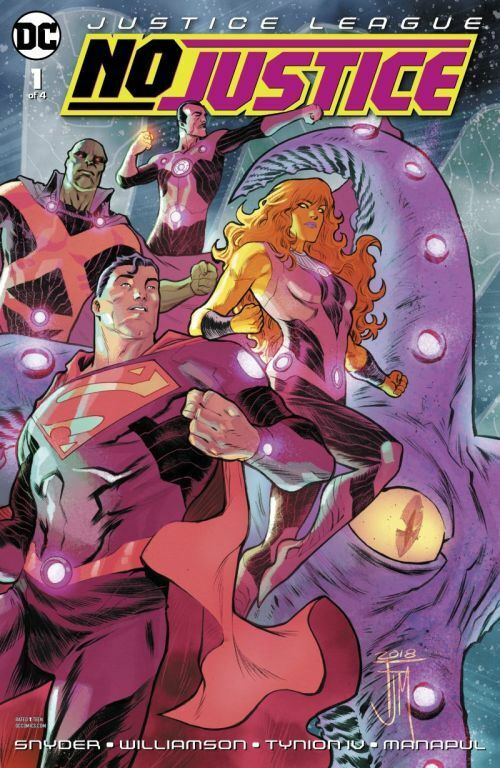 After having broken the Source Wall, members of the Justice League and other heroes are called upon by Brainiac to help contain the menace of four titans that have appeared near Colu, his homeworld set to destroy it. Brainiac needs the help of the Justice League whose actions are responsible for the appearance of the titans near Colu. But Amanda Waller is scheming, having heard of the break in the Source Wall and her action may be detrimental to Brainiac’s plan. Can Brainiac and the heroes of Earth save the world? Justice League No Justice is probably the kind of reboot that was needed for Rebirth but instead we got bad stories and epics Bryan Hitch, Hitch’s Justice League was the most boring I have read in years and I gave up on the series. It wasn’t until Christopher Priest came on the series that it was possible to be entertained by this series again. The challenge of the Justice League is that it has to face more than world-level threats (Hitch provided a lot of that). The Justice League has to feel like the premiere series in the DC Comics line. It is a flagship series. Hitch’s Justice League was not that. However, Scott Snyder is bringing this back. Breaking the Source Wall is playing with a Jack Kirby-related concept that is unique to DC Comics and, is as cosmic and of a grand nature as it can get. Having Braniac gather so many Earth-based heroes to fix their own mess was fun. This prequel series into the rebooted Justice League works. Fortunately, I did not have to read the Dark Knight Metal mess to make sense of this issue. All I had to know was that the Justice League broke the Source Wall and that all is at risk. Great! In this issue, some of the problems that made this No Justice unreadable for me are starting to appear but are not as bad. Snyder is too verbose. His characters talk too much. There is too much exposition and not enough happening. This is worse in the last issue of this series and the first issue of the Justice League but that is a review for another day. This issue was interesting enough. It’s too bad that the rest of just fell down for me and I quickly lost interest. Visually, this issue was strong. The best quality was the colouring by Hi-Fi. The colours are thematic to what is happening on the page and the storyarc. This is not something achieved often in comics. Francis Manapul is of course, an excellent artist as usual and captures some of the grand scale that only artists like George Pérez have been able to represent in these larger-than-life epics that super hero comics publishers enjoy so much.